This contains the four basic controls for interacting with Auracle. Playbar Click and hold, make sounds with your voice, then release and listen to Auracle's reaction to your sounds. Play Lock Locks the play button down until you click on it or the Play button again. Info Text Displays messages from Auracle to you. For example, when it cannot hear sound, Auracle displays a message describing the problem and some solutions. Help Brings you to this page. The Input/Output Level Controls display the levels of sound coming into and being produced by Auracle and provides controls to adjust these levels. If your gestures are coming into Auracle too quietly (which you can see in the "Gesture Display"), you may want to raise the input level. Similarly, if the sound produced by Auracle is too quiet, you can raise the volume with the ouput level slider. This appears whenever Auracle is listening to your voice. For each gesture, four lines are drawn to represent the amplitude, pitch, and timbre information in the gesture. The bottom-most line represents the amplitude, or loudness, of the gesture; the higher this line goes, the louder the gesture is. Moving up, the next three lines represent the pitch and timbre, that is, the frequency content of the gesture. For the frequency visualizations, height correlates to pitch: the higher any particular line goes, the higher in pitch it is. You play Auracle with other people anywhere in the world in groups of up to five players called Ensembles. All members of an ensemble can hear each other's gestures. 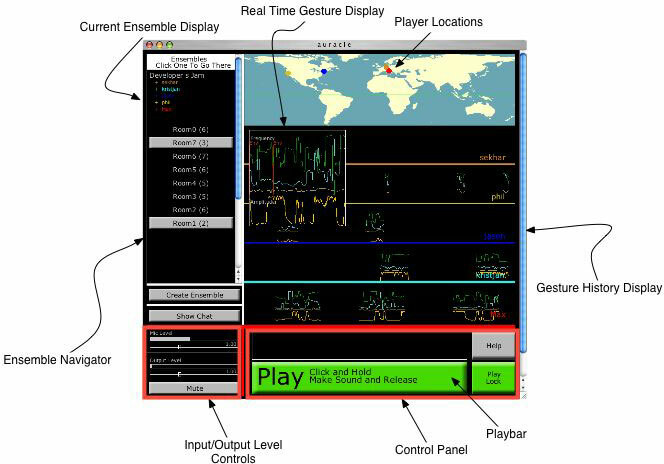 This display shows the gestures produced by each member of the ensemble you are in; each player is shown on a separate line identified by the player's name. A gesture appears here at the moment it is played by the Auracle synthesizer and then gradually scrolls to the left. Displays where you and the other participants of your ensemble are physically located on our lovely planet with a dot in the user's color. Shows the name of ensemble you are currently in, along with your name and those of the other players. Lists the other ensembles out there and how many users they each currently have. You may move into any ensemble by simply clicking on its button. Each ensemble is limited to five participants. Buttons for full ensembles are disabled. Lets you create a new ensemble of your own and automatically places you into it.